Marla Ahlgrimm is the co-author of "The HRT Solution" and "Self-Help for Premenstrual Syndrome." Fish oil has been used for decades in folk medicine to treat everything from agoraphobia to gallstones. But, do these over-the-counter supplements swim a straight line or sink under the weight of their own hype? In this brief informational article, Marla Ahlgrimm goes fishing for the truth. Coronary heart disease – Marla Ahlgrimm reports that there is strong evidence backing the claim that Omega 3s can help lower a person’s risk of sudden heart failure. According to the Mayo Clinic, insufficient levels of EPA and DHA are linked to coronary heart disease. Rheumatoid arthritis – Though more research is still needed to confirm the benefit of Omega 3s where RA is concerned, Marla Ahlgrimm points out that several studies have linked fish oil to reduced joint tenderness. Fish oil appears to be an effective contribution to the relief of RA when taken for at least three months. Abnormal heart rhythms – According to Marla Ahlgrimm, there is promising evidence that supplementing a healthy diet with Omega 3s may work to lower the risk of abnormal heart rhythm in younger adults. 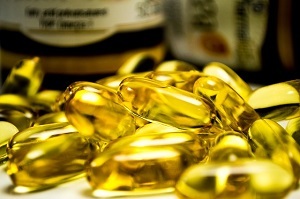 Allergies, cancer, depression, aggression, high cholesterol, antisocial personality disorder, menopause, anxiety, asthma, sickle cell disease – Limited research involving fish oil have offered hope that Omega 3s may assist in the treatment of these disorders but more studies are needed to prove a concrete link, says Marla Ahlgrimm. Those who do not want to take supplements may benefit from eating fish at least once a week. Wild caught salmon is an especially health-conscious choice as it contains plenty of Omega 3 fatty acids and is an excellent source of potassium, pantothenic acid, and choline.